2016 Drawing Lines Group Show Jealous Gallery London. 2000 Chisenhale Artists,The Dash Gallery London. 1997 Circle Paintings The Bedford Hill Gallery, London . 1990 Beyond Structure ( groop show) Chisenhale Gallery London. 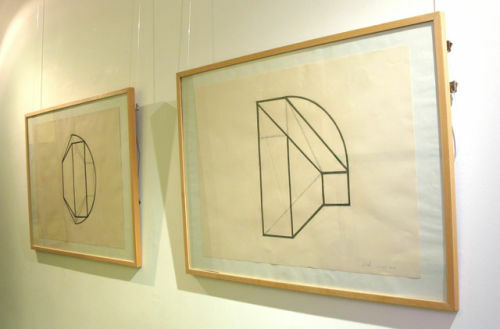 1987 1000 cm3 Geometric Miniatures, Gallerie De Sluis , Holland. 1986 Fish & Chips, Cods & Clams Group Show Boston U.S.A.
1984 The Bakehouse Gallery, Blackheath, London.in association with Greenwich Arts Council. 2015 Paul Smith Ltd New York USA. 1998 Beach Obhur Palace Commission, Saudi Arabia..
1995 Moorfields Eye Hospital, London. 1992 St James Security, Wakefield. 1988 Coca/Cola Schweppes Commission Uxbridge. 2015 Homes & Gardens February issue Abstract Modernism page 61.